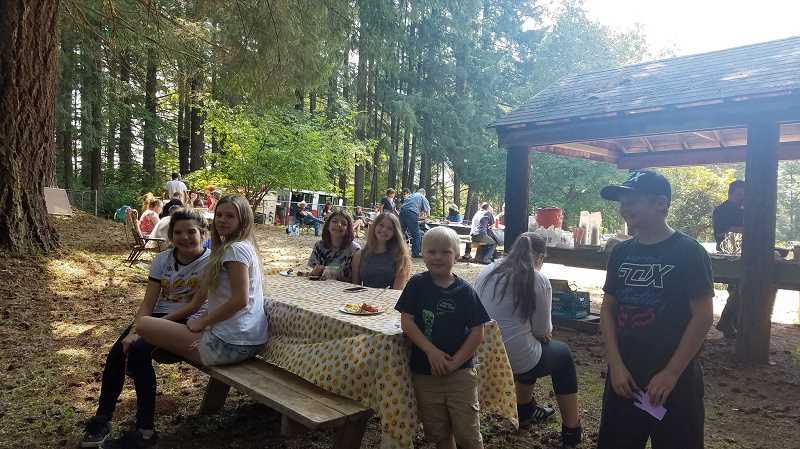 Residents from the Elwood area of Colton held their annual picnic, featuring live music and a potluck meal. The Elwood area of Colton hosted the Elwood Annual Picnic on Sunday, Aug, 12. There was live music and a potluck meal. Brad Kuhn brought the fire engine from the Elwood Fire Station and taught the children about apparatus firefighters use. Many of the Elwood residents took the time to wander through the cemetery, which is adjacent to the picnic area, to get a little closer to the history of the area or to point out family members interned on the grounds. There was an arts and crafts table for the kids and raffle baskets with many donated prizes and the money raised going to pay for the picnic and supplies. "I want to thank everyone who made this day so fantastic," event organizer, Chelsea Skogan-Boyd said in a message. "The band was fantastic. I got to meet some new neighbors and run into a few I haven't seen in a while. It was a lot of fun watching the kids make puppets at the arts and crafts table and learn about the fire truck from Brad. There were some great (food) dishes and fun dessert, and we couldn't ask for more perfect weather. I can't wait to do it again next year."